Picture this: a luxury New York City department store announces plans to open a remodeled flagship location in a historic downtown building. Loyal customers fill with anticipation, and the fashion industry prepares for a milestone year. Construction is well underway by the time store officials realize a big problem: zero cellular reception inside the building. The total lack of connectivity would be a disaster for the sales team, who must rely on the network for credit card transactions — not to mention the issue of bringing customers into a communication vacuum. And while the blueprints foretold of an open layout and contemporary design, the age of the structure, lack of windows, enormous square footage, and obstructive building materials prevented cell signal from reaching the interior. Opening day was fast approaching. What could be done? 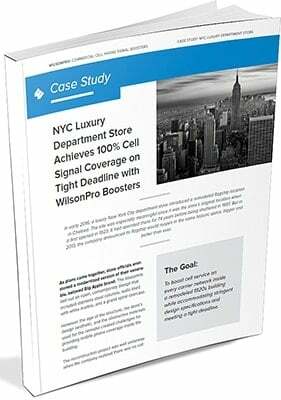 Download the case study to learn how WilsonPro achieved total cellular connectivity throughout store, and can do the same for your business.